darkfmcts3now holds a stable KGS 5d level, on par with the top Go AIs, has beaten Zen19 onceand hold 1win/1lose against a Korean 6p professional player with 4 handicaps. The distributed version, named darkfmcts3in KGS Go Server, use darkfores2 as the underlying DCNN model, runs 75,000 rollouts on 2048 threads and produces a move every 13 seconds with one Intel Xeon E5-2680 v2 at 2.80GHz and 44 NVidia K40m GPUs. 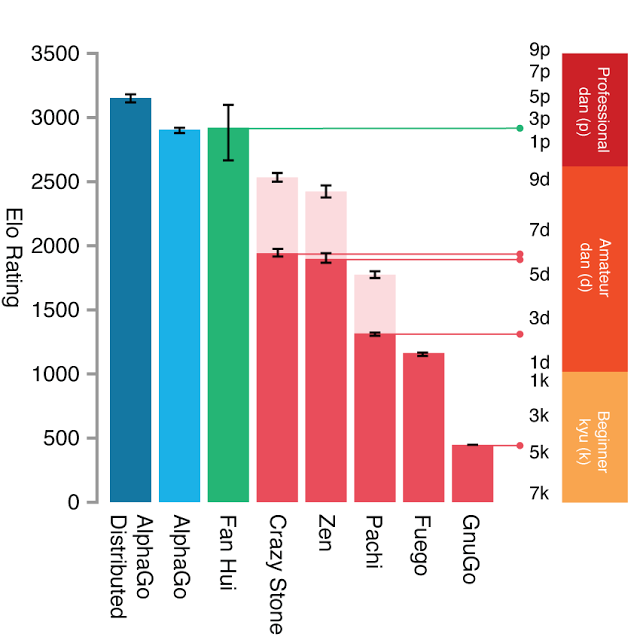 In this paper, we have substantially improved the performance of DCNN-based Go AI, extensively evaluated it against both open source engines and strong amateur human players, and shown its potentials if combined with Monte-Carlo Tree Search (MCTS). Of course, all of this requires a huge amount of compute power, so we made extensive use of Google Cloud Platform, which enables researchers working on AI and Machine Learning to access elastic compute, storage and networking capacity on demand. So we invited the reigning 3-time European Go champion Fan Hui — an elite professional player who has devoted his life to Go since the age of 12 — to our London office for a challenge match. The match was played behind closed doors between October 5-9 last year. AlphaGo won by 5 games to 0 -- the first time a computer program has ever beaten a professional Go player. This entry was posted in Computer, Game, Murmuring, Recreation and tagged alphago, cloud, dcnn, facebook, go, google, platform on January 28, 2016 by Gea-Suan Lin.